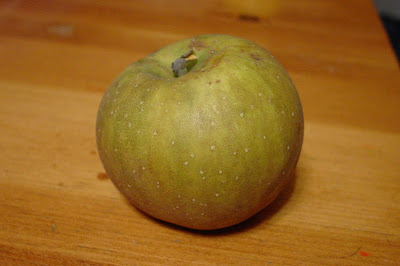 Like many old apples, the originator of this variety is in its name – Ashmead. In 1700, Dr. Thomas Ashmead raised a tree in his Gloucester, England garden. The second half of the name “Kernel”, is a common term for a tree grown from seed (aka pip or kernel). Ashmead’s Kernel is a great example of not judging a book by its cover. This small to medium apple is not found in the grocer’s because of our tendency to buy with our eyes and not our taste buds. Ashmead’s has a drab russeted appearance, resembling a greenish golden smooth potato but beneath this exterior is one of the most splendid tastes in the whole orchard! The British have a candy called a “pear drop” which most North Americans have never tried. The closest thing we have with similar flavoring would be “Juicy Fruit” gum. Most people will find some taste similarities in russeted apples. They tend to have flavor descriptions that sound more like wine than fruit. Common terms used include “nutty, sharp and aromatic” even “hints of oak” have been used to describe Ashmead’s – odd for something fresh off of a tree instead of drawn from a barrel. There is an elusive indescribable character to the Ashmead’s Kernel which sets it apart and is the reason why this apple has been so popular worldwide for hundreds of years. You simply must eat one to know one. Ashmead’s is a fantastic eating apple, especially with a good cheese. Our favorite combination is Camembert (a soft brie-like cheese), sesame crackers and Kernels. Camembert cheese is gaining popularity and can be found in most grocery stores. Historically Ashmead’s has been a favorite for making a varietal cider (hard cider) or to be used in cider blends to add complexity.